On this day a hundred years ago Lord Kitchener, Secretary State for War, called for a 100,000 men to join what was officially ‘The New Army‘ and soon became known as Kitchener’s Army. This image shows new recruits for the Welsh Regiment having just been sworn in and still wearing their civilian clothes. The Welsh Regiment appears to have issued small card badges, all they had to issue at this stage, to show the men had enlisted despite the fact that they were not yet in uniform. A century ago today Great Britain declared war on Germany. 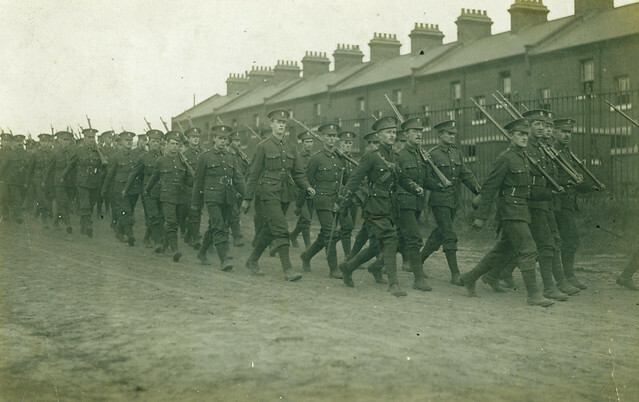 Units of the British Army immediately went onto War Stations and battalions like this one began to march out of camp or depot and towards pre-planned locations to gather in preparation for joining the British Expeditionary Force (BEF). The BEF was Britain’s pre-planned response to a European War and units began to land in France as early as 5th August 1914 with the bulk of the first infantry and cavalry in the following week. Britain was now at war: the hour was go. 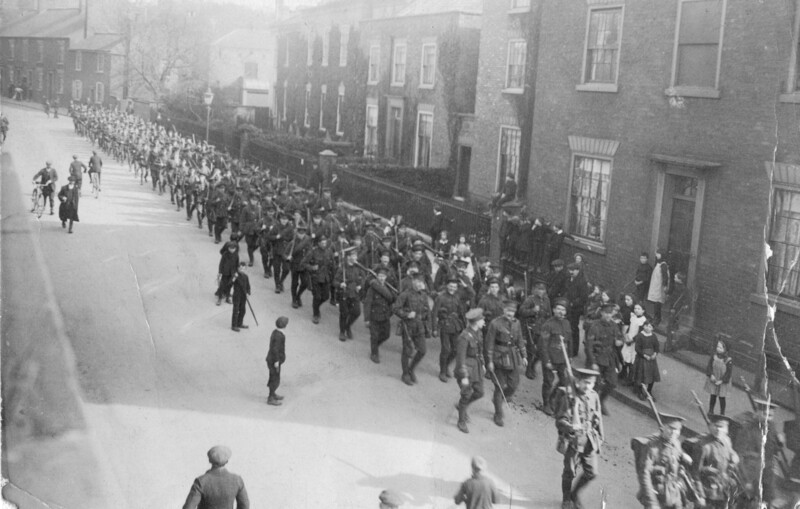 In the summer of 1914 Britain’s armies were on the move. 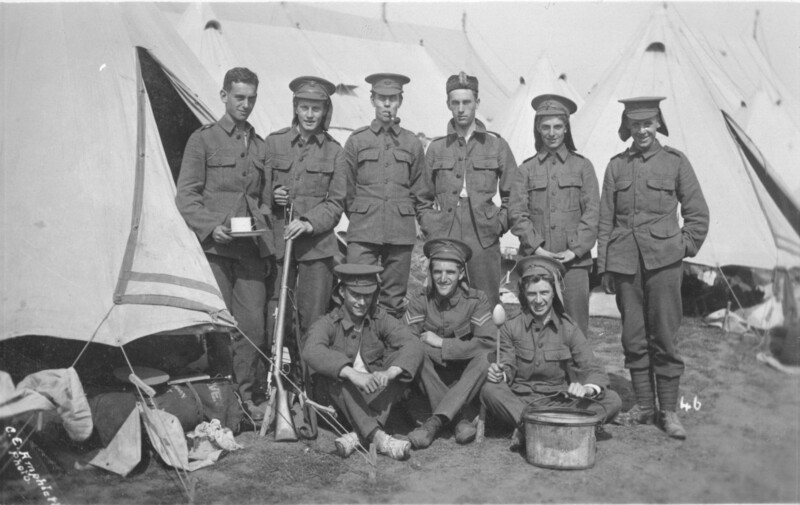 Not the regular forces but the men of the Territorial Force, Britain’s ‘Saturday Night Soldiers’ who were departing all over the country for their annual summer camp. This image from a century ago shows men of the the 15th Battalion London Regiment (Civil Service Rifles) at their annual camp on Salisbury Plain. But this camp was not to last. As July moved into August the road to war now looked almost inevitable as the battalion returned to London and most convinced they would be moving to War Stations in only a matter of days; and they would indeed be proved right. The Crimson Field is a new BBC drama which has been received with what can be best described as mixed feelings by Great War enthusiasts on Twitter. It depicts a ‘Field Hospital’ close to the battlefield and while its accuracy may be questionable there is no doubt it will bring many who want to know more to the subject of WW1 medicine. By way of contrast this image is from a small German collection that may well have belonged to a German nurse or doctor serving in Russia and in France during the Great War. 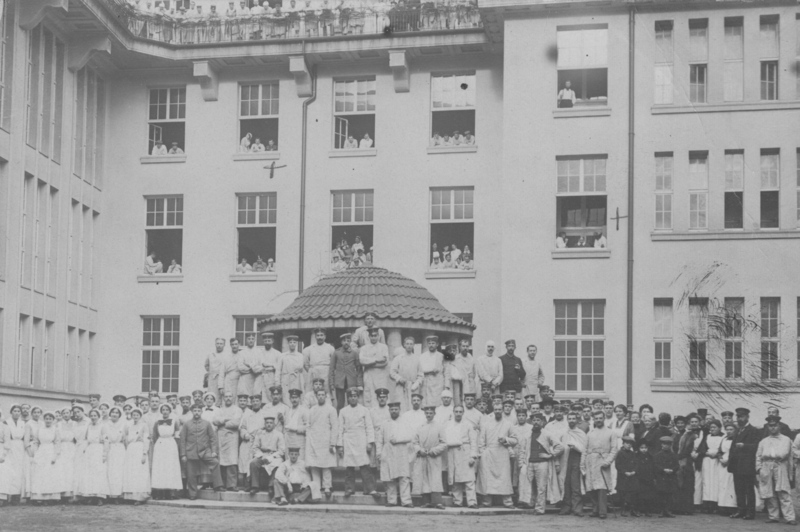 This particular ‘crimson field’ is likely to be in Germany and visible are the nurses, left, and the doctors and orderlies as well as the patients at the window and on the balcony. The image gives an insight into the sophistication of Great War medical arrangements, something very lacking in the current BBC drama. An article that some followers on Twitter posted a link to today, <a href="http://www.independent.co.uk/news/world/world-history/the-gathering-storm-a-look-back-on-middleclass-europes-last-carefree-christmas-before-the-onset-of-world-war-one-9020184.html” target=”_blank”>in the Independent, described Christmas a century ago saying it was “Europe’s last carefree Christmas before the onset of World War One.” It is easy to look back on the Edwardian period as some sort of golden era, a view especially prominent with recent television programmes like Downton Abbey. The reality is poverty was still rife more than a decade after the death of the Old Queen and while the Middle and Upper classes were profiting, many others were not. But it was, of course, the last ‘normal’ Christmas families in Britain, and indeed across Europe, would experience for many years to come. The author Henry Williamson called it the ‘Last Winter of the Old World’, a world in which he had grown from boy to man, and would soon take him in khaki to the front line of Flanders. A year later his Christmas would be on the battlefield; in No Man’s Land at Ploegsteert, face to face with the enemy during the so-called Christmas Truce. 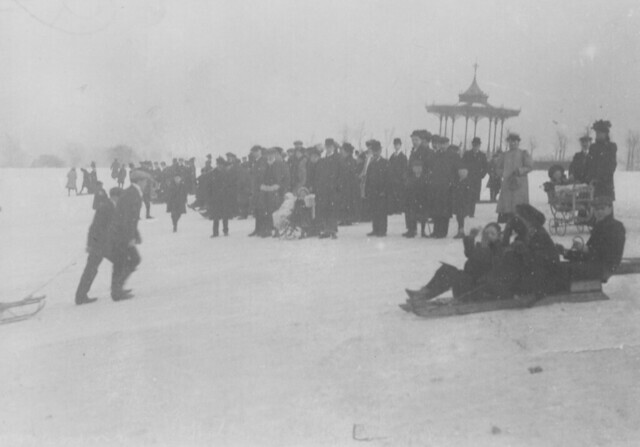 So to mark this important passage in the story of the Great War Centenary, and thinking of old Henry a hundred years ago, the final image for this year is not one of war, but of peace: a winter’s scene in 1913 on Hilly Fields, the open parkland near Henry Williamson’s own home in Eastern Road, Ladywell, South-East London. The Middle Classes of London are out in force, and alongside them no doubt the boys from some of what Williamson called ‘the rougher streets’ who attended the school on the hill, which is still there and still a school; now Prendergast-Hilly Fields College. 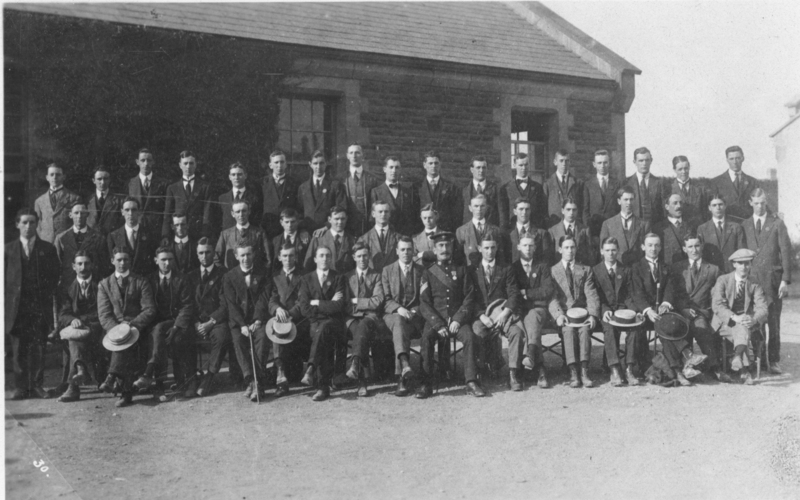 The school has its own war memorial to the old boys who fell, some of whom may well be on this image; but whoever the young men seen here in 1913 are, a year later, like Williamson, they would be off to war and an unknown future; days like these would appear as if part of a different, unconnected past. Ninety-nine years ago today the British government declared war on Germany and for Britain the Great War began. A year from today the Centenary of the Great War starts with a joint reconciliation service of remembrance at Mons with British and German heads of state present. Many of those with a long-held interest in the Great War view the upcoming Centenary with some trepidation. There is a fear the war will be trivialised into convenient media soundbites, a concern there will be too much focus on the dead of the war and not enough on those who survived, and among many academics disgust that achievements on the battlefield which lead to victory will be forgotten. All of these are legitimate concerns but it is clear the Centenary is also a time to educate and share knowledge. That is why I set up Great War Photos some eighteen months ago; a platform like a blog is an easy and accessible way for me to share the thousands of largely unseen images I’ve collected to be seen by a wider audience; and all it costs is some time and a few dollars for a web address. That such a project is of interest to others is clear; the site has so far been seen by more than 200,000 unique visitors from all over the world. People have requested to use images for private research, community projects and publications; all of which has been granted as it is precisely what I had hoped for when I set the site up. I mention all this not to blow my own trumpet but to demonstrate how easy it is to take an active part in the Centenary. Blogs are free; adding images, artwork and sound or video files is easy. Many of those with years of collecting or researching WW1 have some sort of story to tell and surely the Centenary is the time to do that? Others have family stories to add, or names on a local memorial which once researched can be shared with others. All you need is the will and the ability to type. The Centenary should be a time for collaboration and co-operation, as well as a time to publish books, enhance profiles and churn our programmes. Let us hope more and more take on that challenge. So what has Great War Photos got planned for 2014? In the lead-up to the Centenary I plan to publish a number of images showing places on what would become the Western Front, showing how they looked on the eve of war; sleepy villages and flourishing communities. From August 2014 onwards I aim to focus on images connected with 1914: the fighting overseas as well as events on the home front. I am trying to think positively about the Great War Centenary and I hope others will do so as well; it is an important period that should not be wasted by anyone with an interest in the subject. We end this month’s Winter War series with a photograph from Christmas Day 1914. 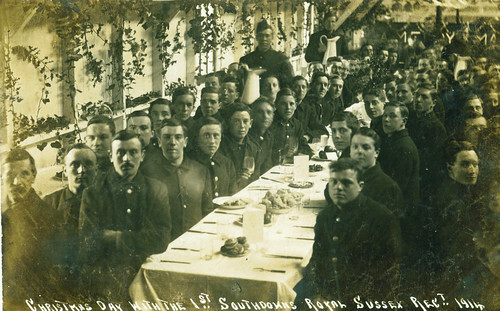 It shows men of the 11th Battalion Royal Sussex Regiment (1st Southdowns Battalion) having Christmas Lunch in their wooden hut at Cooden Camp, just outside Bexhill-on-Sea. The lunch was paid for by the man who had raised the Southdowns, the county of Sussex’s equivalent of ‘Pals’ battalions, Lieutenant Colonel Claude Lowther MP. The men are still in their ‘Kitchener’s Blues‘ uniforms; enough khaki not having yet arrived to equip more than handful of recruits. The 11th would last the longest of all the wartime raised battalions of the Royal Sussex Regiment. It’s war would take it finally to France in 1916, and then in almost every major engagement up to the end of the conflict on the Western Front and in late 1918 to Russia where it would stay well into 1919 fighting against the Bolsheviks. For these Sussex worthies it was the first Christmas of a long war; how many of them in this photo would come home when the battalion was finally disbanded?